Politics can be messy. Politics can be confusing. But, that certainly doesn't mean politics can't be a joy-ride. Join It's Just Politics hosts Zoe Clark and Rick Pluta Monday mornings on Morning Edition as they drill down on what’s happening in Michigan politics. Rick and Zoe tell us how the game of politics is not only fun and thrilling, but has a real impact on the policy-making that affects all of us. Want to know what's really going on inside the state Capitol building? Or, why your lawmaker really voted the way they did? They've got the answers... and much more. It's Just Politics – every Monday morning at 8:50 am on Michigan Radio. Rick Pluta has covered Michigan government and politics since 1987. His first big Michigan political story was the brutal GOP presidential primary battle that pitted Vice President George H.W. Bush against former Congressman Jack Kemp and televangelist Pat Robertson. That battle spawned two competing state political conventions and the now-famous “I Survived the 1988 Michigan Republican Delegate Selection Process” t-shirt. He would pay money now that he did not pay then to get one. He collects political pins - a professional side hobby that’s hit the skids as cost-conscious campaigns have taken a tragic turn toward stickers. He is an excellent parallel parker. Zoe Clark is Michigan Radio’s resident political junkie. She fell in love with all things political when she was eight years old and begged her parents to let her stay up late to follow the 1992 presidential election returns. No way, they said. But she did convince them to wake her up when the race was called. (Which they did.) It was her job to wake up early for four years as the producer of Morning Edition on Michigan Radio. Now, in addition to being Michigan Radio’s resident political junkie. Zoe is Michigan Radio's Program Director. In that role, Clark oversees all programming on the state's largest public radio station - including the station's award-winning newsroom, commentary from voices like Jack Lessenberry and John U. Bacon, and daily news-magazine Stateside. Do you have a question about Michigan politics? Ask us here! A legal battle over redistricting in Michigan could soon be underway. Letters are being sent to some 60 attorneys, legislators and ex-legislators, staffers and ex-staffers, Governor Rick Snyder, and many others, telling them: Anything you have related to the 2011 redistricting process, you better keep it. We’re talking drafts of maps, emails, instructions, and confidential analysis. Does Governor Snyder approve of President Trump's ban on Muslims? Thousands of protesters gathered yesterday at Detroit Metro Airport and in Dearborn, Hamtramck, Grand Rapids and Ann Arbor to demonstrate against President Donald Trump’s ban on immigrants from seven majority Muslim countries. Can Michigan make it to 10 million people? That was Governor Snyder’s goal delivered at his 2017 State of the State speech Tuesday night. The new president, Congress and state Legislature still haven’t been sworn in but Campaign 2018 is already underway. Former state Senator Gretchen Whitmer is the “first” candidate to launch a 2018 campaign for governor of Michigan. Whitmer is a Democrat who spent more than a dozen years in the state Legislature before being term-limited out in 2014. A lot of attention is being paid today to the usually almost-anonymous job of being a presidential elector. This afternoon at the state Capitol, in the state Senate chamber, Michigan’s 16 votes for president will be cast by presidential electors - one vote for every congressional district in the state, plus two at-large electors. It’s a little-noted honor to be an elector. Typically, it’s held for party stalwarts looking to be a footnote to history. There’s one more week of “lame duck” in Lansing as the Michigan Legislature wraps up its 2015-2016 session. Lame duck - the period between the November election and the end of the year - is when the going gets weird in Lansing. The largest vote recount in Michigan’s history has been ordered to begin this afternoon at noon. This afternoon, the Michigan Board of State Canvassers will, in all likelihood, certify the results of the November 8th election - bringing Campaign 2016 to an official close and opening the door to Recount 2016. Michigan, Wisconsin, and Pennsylvania are about to become the center of the U.S. political universe as the Green Party and its presidential candidate, Dr. Jill Stein, try to upset the order of things and make elections officials in those three states go back and check their work. After Tuesday’s historic election, Republicans will continue their firm control of Lansing. Going into last week, predictions, even among Republicans, were that the GOP would lose at least some seats in the state House of Representatives. There were times, in fact, during the campaign, that some even wondered whether Democrats might take control of the House. Michigan is getting the battleground treatment in the final days of Election 2016 with visits from both Republican presidential nominee Donald Trump and Democratic presidential nominee Hillary Clinton. But there is more at stake than the White House. The Michigan Republican Party has announced that it will not have one, large party on Election night in Michigan. This is unusual as both parties traditionally hold election night events for folks running for office and for party activists and donors. The celebrations are usually held at big convention halls or hotels so folks can watch election results come in - think balloons, confetti, and victory speeches. “This whole election, it’s being rigged.” That’s the message coming from Republican Presidential candidate Donald Trump. And, there are certainly some Trump supporters who believe it. But, is there any truth to that claim? Can an election be rigged the way Trump seems to be suggesting? There are three weeks to go until Election Day and Republicans are in despair, while Democrats are paranoid because no one is quite sure what the Donald Trump Effect will be on the ballot come November 8th. It appears the Trump campaign is in a free fall, the statistical analysis website 538 now rates Trump’s chances of winning Michigan at 7.7 percent. Will Gov. 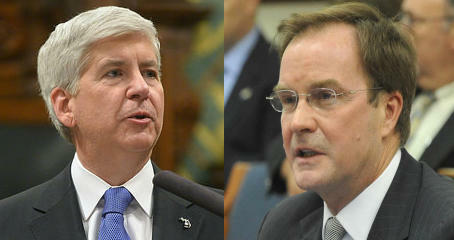 Snyder help - or hurt - fellow Republicans up for election in November? Governor Rick Snyder is not on the ballot this year but he is using Election 2016 to burnish his image and protect his legacy. It’s like November in September as absentee ballots in Michigan are in the mail and, for some, voting has already begun. If history is any guide, about a quarter of Michigan voters will vote using an absentee ballot, even though some will probably lie to do it because not everyone can legally cast an absentee ballot in Michigan. A true toss-up in Michigan's 1st Congressional District? Michigan’s 1st Congressional District is huge - almost 25,000 square miles - and it is where, with the pending retirement of Republican Congressman Dan Benishek, former Marine Corps General Jack Bergman – a Republican – is facing former Michigan Democratic Party Chair Lon Johnson. Democrats in Michigan are breathing a sigh of relief now that the fight over straight-ticket voting in Michigan is over. For now, at least. The U.S. Supreme Court torpedoed Republican efforts on Friday to deep-six a Democratic advantage in the Michigan election process. Michigan Republicans and Democrats held their summer nominating conventions over the weekend. Our It's Just Politics team of Zoe Clark and Rick Pluta sat down with us today to break down both conventions. There is a saying in politics that three-quarters of what you do in a campaign doesn’t matter -- you just don’t know which three quarters until after the campaign is over. That’s because there are so many variables that can make a difference once the voting starts, so candidates, campaigns, and political parties do all they can to gain every marginal advantage. How much of a role will the state of Michigan’s economy play in deciding your vote in November? Last week, the presidential candidates acted as if it might be a big deal as they both made stops in Michigan to deliver speeches on jobs and the economy. Michigan, and Detroit, in particular, remain economically emblematic. But there are two stories to tell and the candidates each packed a different one for the trip. Trump and Clinton will both be in Michigan this week... but, why? Hillary Clinton and Donald Trump are both coming to Michigan this week which begs the question: is Michigan in play come November? After tomorrow's congressional and legislative primaries, just 97 days remain until Election Day 2016. Of course, it's never too early to look ahead to the 2018 elections and, at least one petition campaign is already making plans in that direction. 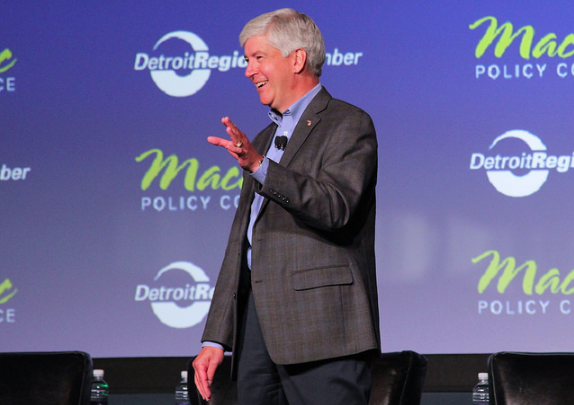 Governor Rick Snyder says he’s staying out of the presidential race this year, but he’s not staying out of politics. This past week, Snyder’s political operation picked more than a dozen Republicans to support in state races. There’s a new chief for the embattled state Department of Environmental Quality (DEQ) but the effort to restore confidence to the agency that was a huge part of the Flint water crisis is off to a rocky start. The sultry days of summer are no break from politics. In fact, the state Legislature’s summer recess is becoming a political wedge itself. The latest re-invention of public schools in Detroit is underway with the state trying yet again to overhaul the district facing huge financial and academic difficulties. But it’s still too early to declare victory. This new plan out of Lansing is without the support of legislative Democrats, the Detroit delegation and Mayor Mike Duggan. But it does return the Detroit public schools back to the control of a locally elected school board. This is coming after many state appointed emergency managers over seven years have tried but failed to turn around the district. The group that’s trying to legalize marijuana in Michigan is telling the state: See you in court. And the outcome of the challenge could have a huge impact on politics, law-making, and future elections in Michigan. Governor Rick Snyder is trying to make the best of it as a plan he endorsed to try and save the Detroit Public Schools is starting to look like it isn’t going to happen. The Detroit Public Schools are in financial crisis. The district could go into default - bankruptcy is even an option - if the the state Legislature doesn’t adopt a bailout plan this month. If that happens, it’s possible tens of thousands of students in the city could be without a school to go to come fall.